Doug Brooks, a local ceramicist and metal worker, has spent years perfecting his techniques in the Raku style of pottery. Prior to opening Dirt Dauber Pottery, Doug owned and operated a commercial and heavy industrial construction company then a successful company within the financial services industry. 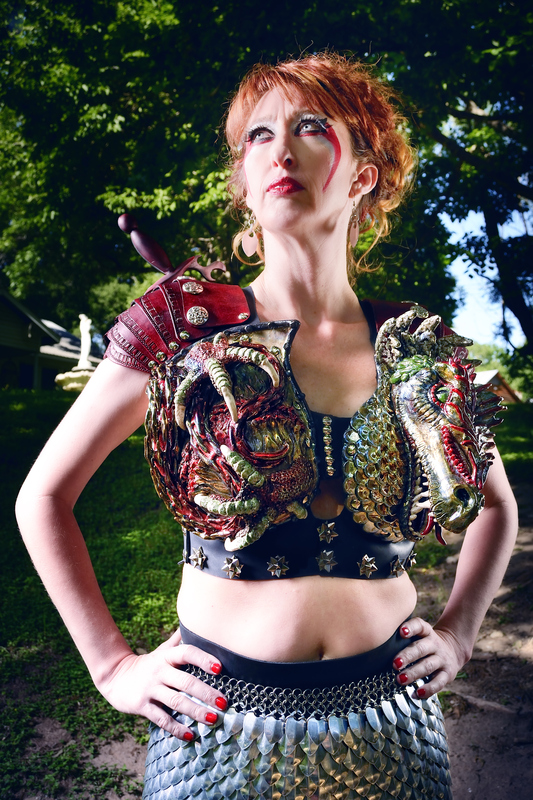 Doug created his first piece for Art Bra Austin last year, when his best friend and Art Bra Model, Lisa McVey, asked if he would design a piece specifically for her to wear on the runway. He enjoyed the people he met through Art Bra Austin and the opportunity to help Lisa pay forward the kindness she has received from BCRC. While dragons are often thought of as creatures of destruction, “The Ferocity of Love” portrays a dragon protecting the precious material that lies beneath – however victory is in no way assured. Doug chose to create a dragon because while they attempt to protect their gold, they often end up destroying their surroundings as well as the intruders. To Doug, this is similar to what cancer does and no amount of love or strength can save everyone from the devastation cancer causes. In this piece, the dragon also symbolizes Lisa’s continued strength – she is recovering from a recurrence of breast cancer; and it embodies the love and support of her parents, her boyfriend Scott, and BCRC. Doug created this piece in the Raku style of pottery. In Raku, molded clay pieces are removed from the kiln while they are still hot and placed into a chamber of combustible material such as sawdust. This “smoking” process blackens sections of the clay creating unique patterns. In order for this piece to turn out perfect, Doug had to wait for just the right day with the right outside air temperature and wind speeds so that the piece wouldn’t break as it was fired, removed from the fire, or while it cooled. To view more of Doug Brook’s work, please visit www.dirtdauberpottery.com. For a complete list of Art Bra Austin artists and art bras, download the Art Bra Austin mobile app! Available here for Android or iPhone. Photography generously provided by Flashbax Twenty Three Photography.